Are you in need of a storage unit rental service? Arwood Waste Sarasota, FL Division offers a complete line of portable, commercial, temporary and long-term storage rentals, shipping and moving, and rent a storage unit services. 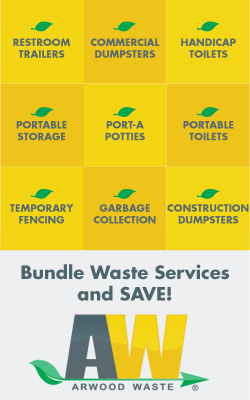 Portable storage from Arwood Waste can help you expand your business, make home-improvement projects easier, improve productivity and ship items worldwide. Storage units for rent are the way to go. Call one of our storage unit rentals and moving experts to learn what advantage portable storage can bring to your next project or operation and for storage storage unit rentals. Arwood Waste can give you long-term storage options for lay away storage projects in Sarasota, FL. Our Portable Storage Unit rental rates are competitive with regular storage facilities, plus, you won’t have to load and unload again like you would with those places. The Arwood Waste storage facility features 24 hour security and surveillance, so you can be sure your items are safe and won’t suffer damage or loss. If you are looking for storage container rental in Sarasota, FL, Arwood Waste can help advise you on how to place and secure your commercial container. A commercial container should be placed on a solid foundation, with support at the four corners from concrete, railroad ties, asphalt, a gravel bed or other sturdy surface. Our professionals can also advise you on how to keep it level and avoid any drainage issues or structural problems, like pinched doors. Call the experts at the Arwood Waste Sarasota, FL Division in Sarasota, FL at 941-312-2744 or email [email protected] today if you are looking for a portable storage unit rental cost or have any other questions about renting a storage container. Copyright © 2019 Arwood Waste of Sarasota. All Rights Reserved.